Everyone knows that animal shelters do some truly essential and lifesaving work by providing our four-legged friends with a temporary place to call home. Still, we all hope they won’t have to spend too much time there, especially since waiting to be adopted can be a stressful time for animals. No animal should have to spend their entire life in a shelter. One cat named Sigmund who was living at the Cat Haven WA shelter in Australia was afraid of just that. While he was initially adopted shortly after he first arrived there, he was returned when his new owner deemed him too rough. 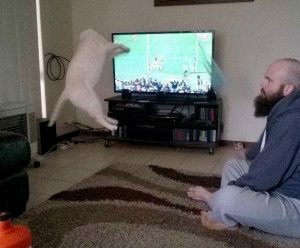 So this clever cat came up with an adorably hilarious method to catch the attention of potential owners… What was his plan? To stick out his tongue. 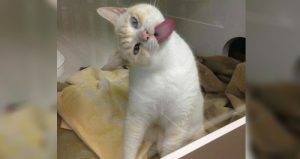 Actually, he was licking the glass, but when shelter staff saw this, they began taking photos of him in mid-lick and posting them online. What better way to show he’s one silly kitty who would make a wonderful companion? 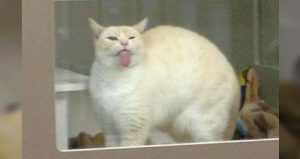 “Sigmund is getting up to some odd tactics to try and find his new owners… turns out you won’t just adopt a cat, but you’ll get a window washer as well. 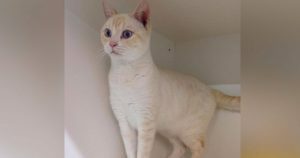 If you like a bit of an oddball, Sigmund is up for adoption now,” the shelter wrote in a Facebook post. And the photos that the staff took of Sigmund did their job! Now, this four-year-old feline has found a family who wants to give him the loving forever home that he deserves! Apparently, Sigmund has taken quite well to his new owners, showing them his quirky side early and often. “Sigmund is quite nervy and high strung, he loves to look out windows, lick walls and windows, and play with a ball of wool and my son,” his new owner wrote in an update to the shelter. “He has a very high vertical leap, spins in the air and somersaults. We don’t find him rough at all.” So in the end, Sigmund’s antics paid off and put him in a loving home that embraces his silly quirks.